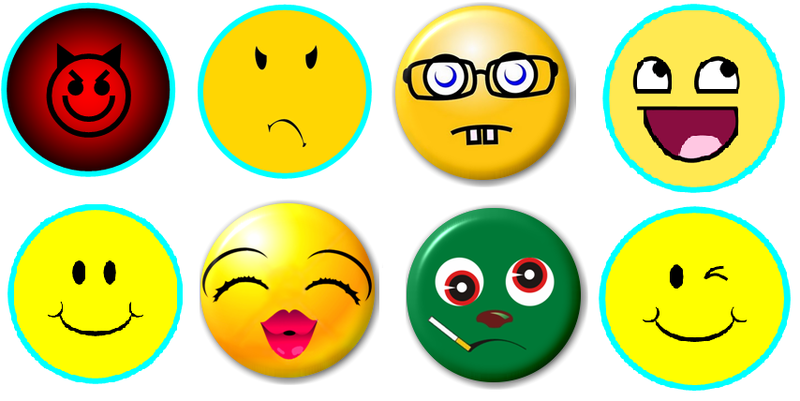 Left-Right and Top-Bottom = devil/meany face (>=)), angry/frowny face (X-(), geek/nerdy face (😎), excited/laughing face (😀), happy/smiley face (🙂), smooch/kissy face (:-*), wasted/stoned face (:-O) and the infamous flirt/winky face (😉). 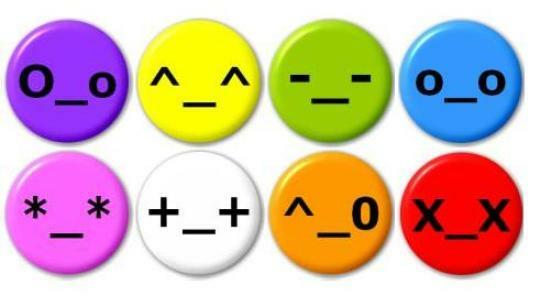 Left-Right and Top-Bottom = purple ( ) which represents being confused/sarcastic (a raised eyebrow), yellow (^_^) which represents being cheerful/elated, green (-__-) which represents being exhausted/perplexed (a sigh), blue (O_O) which represents being shocked/surprised (a widened gaze), pink (*_*) which represents being bashful/shy, white (+_+) which represents being angry/furious, orange (^_0) which represents being flirty/teasing (a wink), and red (X_X) which represents being dead/in trouble. I hope this new collection sells as well as its predecessor!